The Bec Hellouin model for growing food, sequestering carbon, creating jobs, and increasing biodiversity without using fossil fuels When Charles and Perrine Herv -Gruyer set out to create their farm in an historic Normandy village, they had no idea just how much their lives would change. Neither one had ever farmed before. Charles had been circumnavigating the globe by sail, operating a floating school that taught students about ecology and indigenous cultures. Perrine had been an international lawyer in Japan. Each had returned to France to start a new life. Eventually, Perrine joined Charles in Normandy, and Le Ferme du Bec Hellouin was born. Bec Hellouin has since become a celebrated model of innovative, ecological agriculture in Europe, connected to national and international organizations addressing food security, heralded by celebrity chefs as well as the Slow Food movement, and featured in the inspiring C sar and COLCOA award-winning documentary film, Demain ("Tomorrow"). 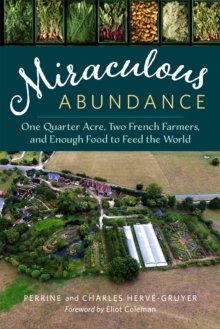 Miraculous Abundance is the eloquent tale of the couple's evolution from creating a farm to sustain their family to delving into an experiment in how to grow the most food possible, in the most ecological way possible, and create a farm model that can carry us into a post-carbon future--when oil is no longer moving goods and services, energy is scarcer, and localization is a must. Today, the farm produces a variety of vegetables using a mix of permaculture, bio-intensive, four-season, and natural farming techniques--as well as techniques gleaned from native cultures around the world. It has some animals for eggs and milk, horses for farming, a welcome center, a farm store, a permaculture school, a bread oven for artisan breads, greenhouses, a cidery, and a forge. It has also become the site of research focusing on how small organic farms like theirs might confront Europe's (and the world's) projected food crisis. But in this honest and engaging account of the trials and joys of their uncompromising effort, readers meet two people who are farming the future as much as they are farming their land. They envision farms like theirs someday being the hub for a host of other businesses that can drive rural communities--from bread makers and grain millers to animal care givers and other tradespeople. Market farmers and home gardeners alike will find much in these pages, but so will those who've never picked up a hoe. The couple's account of their quest to design an almost Edenlike farm, hone their practices, and find new ways to feed the world is an inspiring tale. It is also a love letter to a future in which people increasingly live in rural communities that rely on traditional skills, locally created and purveyed goods and services, renewable energy, and greater local governance, but are also connected to the larger world.